It is time to feature another stamp set from Close to My Heart. This set is called “From the Grapevine”. I think it is a very old set. I bought it second hand like most of my CTMH stamps. One funny thing about this particular set is that it is extremely sticky!! The stamps stick to everything, even my hands! I am not sure why that is, either because it is very old or because of the way the previous owner used it… some of the stamps were black and when I wiped them with the stazon cleaner, ink came off. However, because they are so sticky, I could stamps them with distress inks! something I can’t do with other stamps…at least not with satisfactory results. 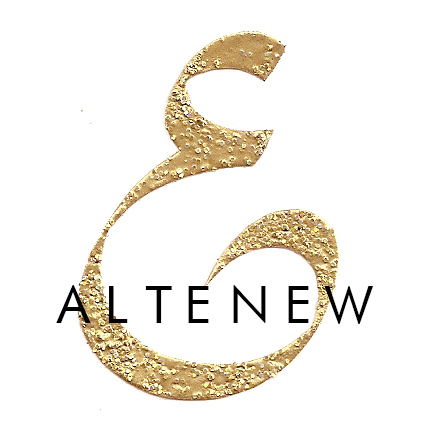 Even though it is not very clear, I embossed the vine and one of the leaves in gold. I colored in the leaf using Distress ink “Crushed olives” and a water brush. I curved the sentiment stamp when placing it on the acrylic block, and stamped with Versafine onyx black. Some time ago while browsing on the net I had come upon a wood block stamp of a Grape cluster. I liked how it looked and sketched it out. So when I stamped this cluster, I followed that sketch. 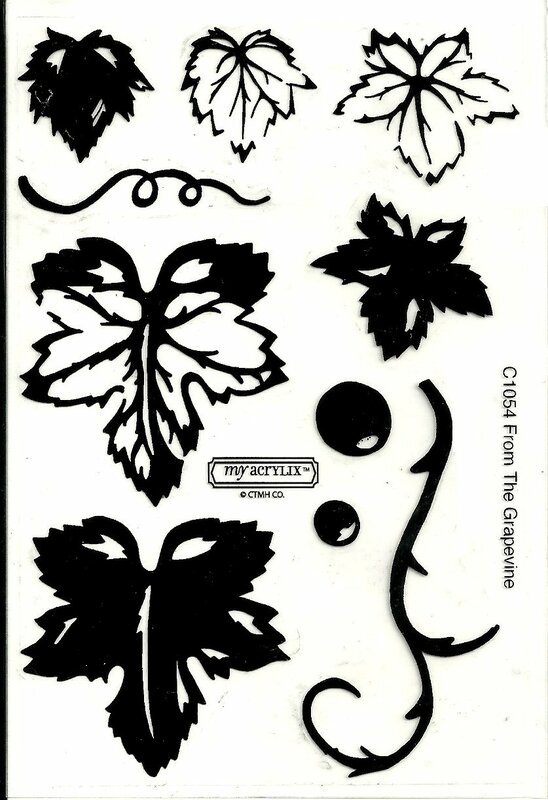 I masked the grapes as I stamped (I just cut out three individual grape masks and used them repeatedly). 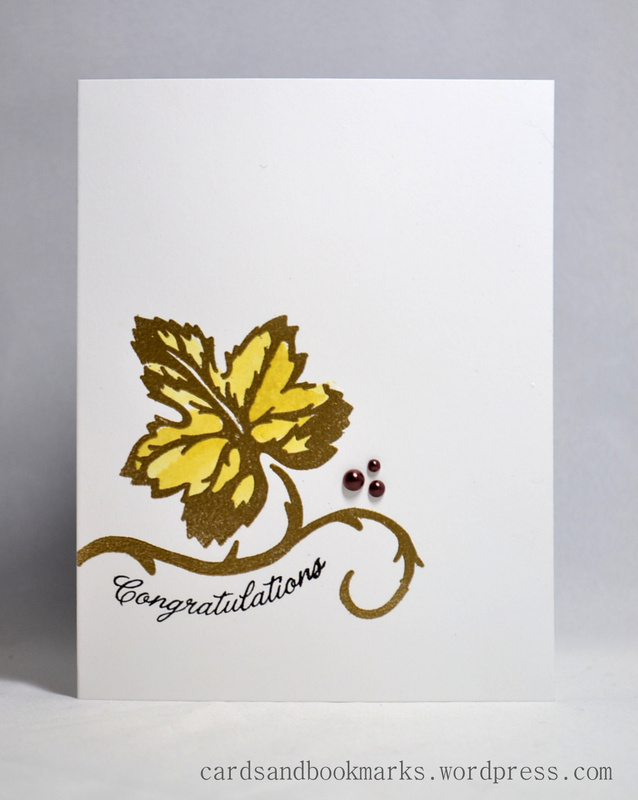 I stamped the grapes and the leaves all on separate pieces of paper and cut them out, then arranged them on this card. Here I used Distress inks (crushed olive and shabby shutters) to stamp the leaves randomly. The outline is first generation while the inside of the leaves is second generation stamping. I cut out a 1″ strip and inked it up with a sponge applicator and a CTMH ink (Vineyard berry) then embossed the sentiment in white. 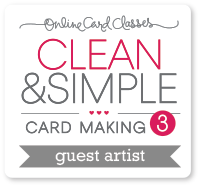 This time I only made three cards. I did have a few more ideas, but couldn’t make time to try them out. When I get a chance, I will add them here later. Oh I totally remember that stamp set! My co-worker bought it, and when I was at her house I stamped 4-5 grape clusters so I could use them later. Of course, I never did : ) You’ve done a great job making these look current and really attractive! Love your series on these old sets, Tasnim! Fun cards Tasnim! 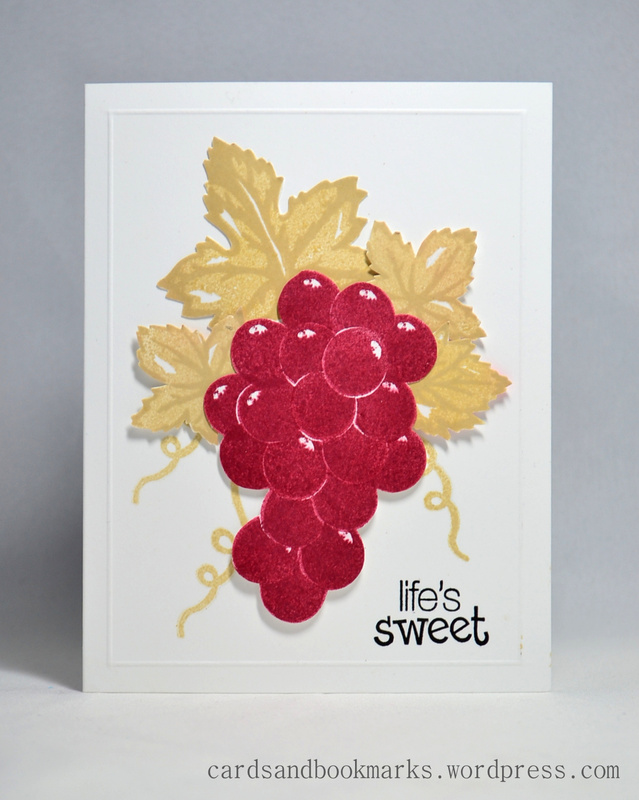 The masking on the grape cluster is impressive, and I love the gold embossing on your first card! Great cards Tasmin . I love the colours – I cannot pick a favourite !! Thank you for sharing.